I’ve acquired many baseball caps in my life but I don’t wear them. I think the most I have ever worn one was during a trip to Disney World when I was a kid. It was an adult size hat and made my head 4 or 5 inches taller. Anytime I see pictures from that vacation all I can think about is how ridiculous that hat looks. This is why I never mailed in inserts from books: I didn’t want to mess it up, even though there wasn’t anything on the other side. @Chris: So did these extra inches get you on any rides not normally available? I admit I dislike ripping things out like that, I always wonder if I should be cutting out the coupons, since no1 else has looked at the ads yet… and then I see them in store later so it’s like, what’s the point?! I have like one hat, buried somewhere. I suppose they’re good in the summer, I just don’t like the feeling of them. I don’t wear hats because my head is ginormous. Hats don’t fit. And if they do they look tiny. I won’t tear stuff out of anything. I won’t dog-ear pages in books, cut out coupons, or even write in them. It just seems wrong to me. 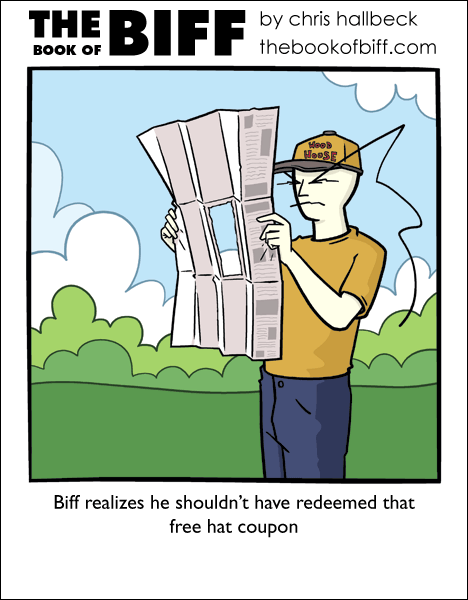 I used to wear hats, but then I noticed that most of mine had lopsided bills, and that bothered the heck out of me. I have a green hat with little pot-metal medals stuck all over it. I love that thing to death, but my boyfriend hates it. Most of my baseball caps I inherited from a guy I went to church with, who died and his widow gave them to me after I helped her clean his things out of their house. Creepy AND true.